What is Driving Risk ? Driving risk is the risk taken by the driver at every moment during driving task. Let’s say in a manufacture there is a very dangerous machine that may grind up your hand. If you are 10 km away from the machine, risk is “very” low. If you are 1 km away from the machine, risk is the same. If you are 10 m away from the machine … risk is still very low … but if you come closer (let’s say 10 cm), suddenly risk becomes high ! This is not linear. 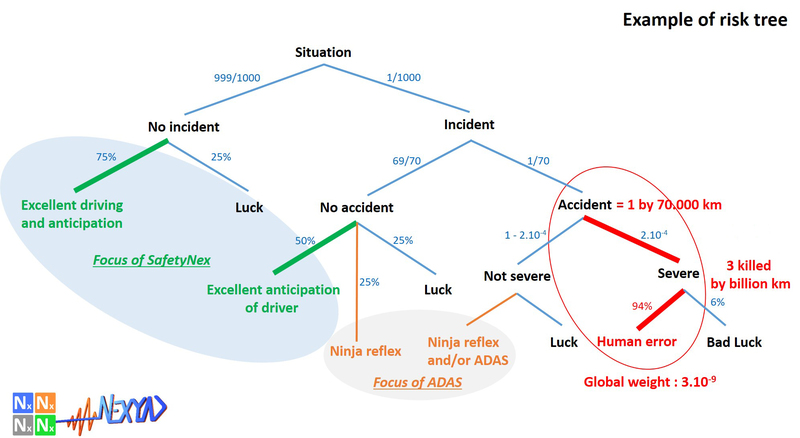 In road safety, the Artificial Intelligence algorithm SafetyNex estimates 20 times per second the driving risk you take, and many people ask about relationship between “risk you take” and “accident”. This relationship is not deterministic (probabilities must be used) : risk is not linked directly to accident but rather to accident frequency (or probability) … and the relationship is a non linear curve called a “S” curve as shown on the figure below. It is possible then to use it to alert human driver (Vocal Driving Assistants) or to control autonomous driving (Autonomous Vehicle) in order to keep risk under the threshold of the “S” curve or not too far after the threshold. SafetyNex was calibrated in order to have 95% of accident frequency just after the threshold (validated on 50 million km). A regular good driver will generate a SafetyNex driving risk(t), 20 times per second, between 0% and 70% with a maximum likehood between 30% and 60% depending on driver’s self confidence. SafetyNex alerts at 90% and takes into account mostly [80%-100%] of driving risk slot to compute Safe Driving Score at the end of a trip, according to the S curve theory. What is the scientific background used by SafetyNex for Driving Risk assessment ? This approach is in use in many domains confronted to risk management as the firemen, the FBI, in Nuclear Plants, etc. NEXYAD is the first and only team that applied it to road safety. Why severe braking and harsh acceleration are not good estimators of Driving Risk ? It is very obvious, the same driving behaviour on a disused airport, on a highway, in front of a school, in a dense city approaching an intersection, etc… do not correspond to the same driving risk ! And no one can deny it. If you measure driving behaviour without knowing driving context, it is impossible to compute driving risk. Training drivers not to do severe braking is very dangerous: they will hesitate even if a child surrounds in front of the car. Severe Braking is sometimes absolutely necessary. And that is why car manufacturers develop more efficient braking systems at each car generation (drum brake, disc brake, ABS, EABS emergency assisted braking systems), spending a lot of money for it ! If you take safe driving coaching course, they will teach to break your speed very harshly in case of any doubt. Road Safety should not use “intuition” of non-expert people or “belief”, but science and facts. Just to make sure that our explanation makes sense, let us compare on a very simple case of urban risky situation (STOP sign) the harsh braking detection and the SafetyNex alert. – Use case 1 : the driver arrives too fast approaching a stop sign. Instead of anticipating, this driver sees the stop sign at the very last minute and brakes very harshly. It is possible to put a threshold on acceleration value and then detect the harsh braking. This harsh braking detection obviously corresponds to a driving risk, and the figure 1 shows when it happens on the pathway. SafetyNex predicts the next locations of the pathway, and estimates in real time if driving behaviour is adapted or not to the complexity and singulatities of road infrastructure ahead. 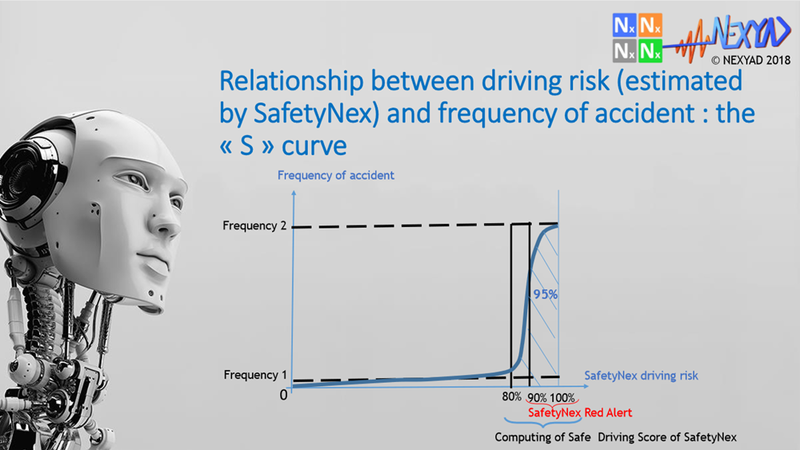 Because SafetyNex cannot predict that the driver is going to brake (the behaviour does not show it), SafetyNex driving risk rises as shown on figure 2. One can notice that as soon as SafetyNex understands that the driver finally brakes enough to stop the car, then driving risk falls down very quicly. Driving risk rises BEFORE potential accident : first you take risk, and second you may have an accident. SafetyNex and harsh braking criteria both detect that the driver took risk in such a situation : if you count alerts, you have 1 for harsh braking and 1 for SafetyNex. What is the difference ? Well SafetyNex anticipates and then SafetyNex can alert the driver a few seconds before stop sign, letting time to slow down, where harsh braking criteria only monitors but cannot be used to alert because it has no anticipation feature. This driver that is much more dangerous than the previous one is not detected by harsh braking detection. Harsh braking detection is not effective on this use case. Risk falls down only when situation is left behind : after crossing the stop sign, it is too late for risk assessment, it is an « alea jacta est » situation, you will have an accident or not depending on luck, there no possible anticipation. Everytime that harsh braking corresponds to a real risk, SafetyNex also gives an alert. And SafetyNex still gives alerts in very dangerous situations where harsh braking detection is not effective. SafetyNex is simply the next generation for driving risk assessment, you can now forget harsh braking detection and leave it all behind. One more point, SafetyNex risk rises BEFORE dangerous situation, then you can alert driver and ACT on accident rate reduction. 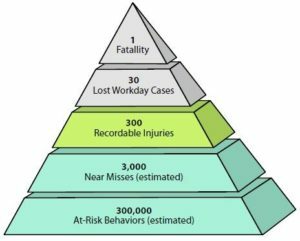 SafetyNex can reduce accident rate by 20% for a regular inattentive driver (your ROI evaluation is easy to do). Why recording of “black spots” geolocation cannot help to do Driving Risk assessment ? A black spot is a location where a few drivers had a behaviour that was not adapted to the road context. They had then an accident (usually a severe accident). What about you? Here and now. If your behaviour is adapted to driving context, then this place is NOT a black spot for you. Moreover, most drivers (very numerous) did not have an accident at this location. What you need to know is your real time risk assessment, you do not need to know that others drivers with different behaviour took risk at this location. Do you have an example of Driving Risk evolution among a trip ? Here is a demo of SafetyNex alerts during a real trip (using a simple implementation of SafetyNex API into a smartphone App made for demo ). 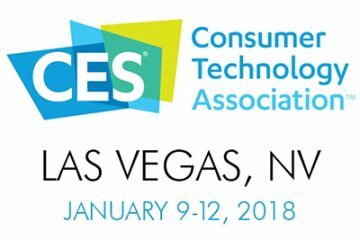 This App alerts driver BEFORE a dangerous situation, letting time to slow down and avoid a potential emergency situation (application to Vocal Driving Assistant for Automotive industry, or to Accident Prevention for Insurance / Fleet risk management). If you work on robotized car (ADAS or Autonomous Driving, just fancy that SafetyNex alerts your AI system intead of the human driver). BEWARE with the statistics : “94% of severe personal damage accidents are due to human errors” doesn’t mean that you’ll save 94% of severe accident with autonomous driving : drivers do not only make mistakes they also drive well (1 accident every 70 000 km to 100 000 km, 3 dead every billion km – OCDE) … It is important to study also good driving and near misses (when driver has the right behaviour to avoid accident or to mitigate severity)… That’s what NEXYAD did during 15 years of research programs on road safety ^^ (that led to SafetyNex). See image (if you do not provide the “green” features, you will lose lives more than you gain with your driverless car. Our AI algorithm SafetyNex was made for this. And SafetyNex is a XAI (eXplanable artificial Intelligence) so you can trust it (see Darpa research program on XAI).